17 September 2010, at 8:09a.m. 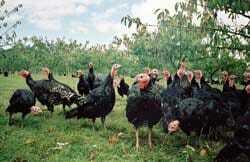 UK - COPAS Turkeys has been commended at the Soil Association's Orgnaic Food Awards. Copas Traditional Turkeys has received its third national award of the year, achieving a 'Commended' award for their Free Range Organic Turkeys at the highly acclaimed Organic Food Awards, run by the Soil Association. Now in their 22nd year, the Organic Food Awards showcase the very best in organic food and drink, and highlight the imaginative and successful ways in which individuals and companies are contributing to the renaissance in organic, local and seasonal food. The Copas Turkeys team are delighted that their Free Range Organic Turkeys have been placed among the country's most highly rated organic foods. Jodie Cavaye, Sales & Marketing Manager, says of the win: "We have always been committed to producing the highest quality turkeys and started raising organic flocks four years ago. We are delighted with the judges’ decision, particularly because the category is so broad. All too often turkey is seen as a bland, processed and sliced chicken substitute. It is a true testament to our traditional methods that our turkeys can hold their own amongst other meats when competing on taste, smell, texture and appearance." Copas Free Range Organic turkeys are produced using the same traditional methods that give all Copas Turkeys their superior taste and flavour (adult birds are plucked by hand and hung for two weeks like a game bird), however their diet and grass meadow fields are organically certified. Fifty eight expert judges – including chefs, restaurateurs, food writers and nutritionists – sniffed, nibbled, slurped and chewed their way through over 600 different products in 12 categories at a four-day tasting hosted at The Duke of Cambridge organic pub in London. Hugh Fearnley-Whittingstall presented the Organic Food Awards at the annual Soil Association Organic Food Festival in Bristol on 11 September. This award comes hot on the heels of a spate of award wins for Copas Turkeys recently. Earlier this year the company won the Health & Welfare in Poultry Award (run by Pig & Poultry Marketing magazine) and Copas Free Range Bronze Turkeys won two Gold Stars at the Great Taste Awards, satisfying exactly what consumers are looking for in the meat they consume at the moment – healthy living conditions, high animal welfare credentials and, of course, great taste.